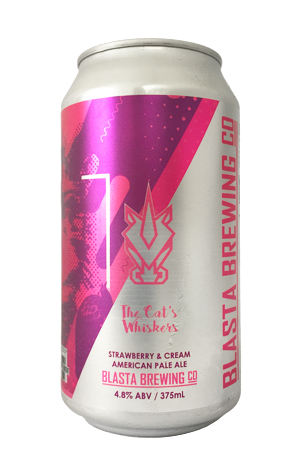 First up, we should probably express our gratitude that Steve Russell didn't opt for the canine slang equivalent when coming up with a name for this beer; the cat's whiskers is a far better image to have in mind when bring a beer to your lips... For Blasta, the name is a reference to the smug cat who got the cream – or lactose addition in this case – something that’s digitally rendered on the can as the brewery's tinnie lineup expands. Originally released in support of the 2018 strawberry tampering outbreak, the 2019 iteration is more in line with the summer dessert strawberries and cream. The visually deceptive peach-apricot coloured beer soon aligns with the concept through rich strawberry and vanilla aromas. As the initial sweetness dissipates via a balancing fruit tartness, a full, creamy mouthfeel brings cohesion and, perhaps, a touch of smugness to proceedings with the realisation of just how far the fruit and lactose additions have taken this beer from the American pale ale upon which it's built. NB This is also the first canned release since Blasta signed with distributors Northdown, which will see their beers appear more nationwide.